With the Batman Travel Mug on your utility belt, you'll be unstoppable! This travel coffee mug features the Batman logo in sleek style. At 16 oz. and with double walled insulation, it'll keep your drink hot through a night of fighting crime. 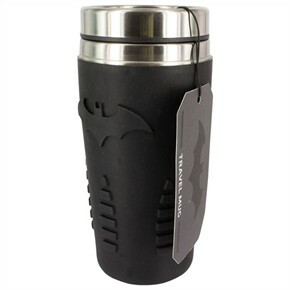 With silver stainless steel and a black silicone sleeve, this travel mug is more stylish than Bruce Wayne! A Batman Travel Mug is the perfect gift for any Batman fan. Availability: The Batman Travel Mug takes approximately 1 business day to leave the warehouse in addition to transit time.